Replies: 62 (Who? ), Viewed: 55521 times. A lot of simmers would like to have objects from The Sims 2 games to use in The Sims 3, and this is my contribution to this project. It only contains how to collect mesh and textures from The Sims 2 or Custom Content packages. If something in here is explained wrong, or you know a better way to do this, please let me know asap so I can change it. The first thing we need to do is create a project folder on our “Desk Top” to keep our files in and stay organized. Make a seperate map in it for the Sims2 and the TS3 files. To be able to convert an object from TheSims2 to TS3, we at least need the mesh and a texture for it. If you want to convert a Custom Content object, you don't have to do Part 1, and can start with Part 2. If you want to share your creation, don't forget to ask the original creator for permission. Part 1 Cloning a Sims2 object from the game. button on the bottom of your screen. 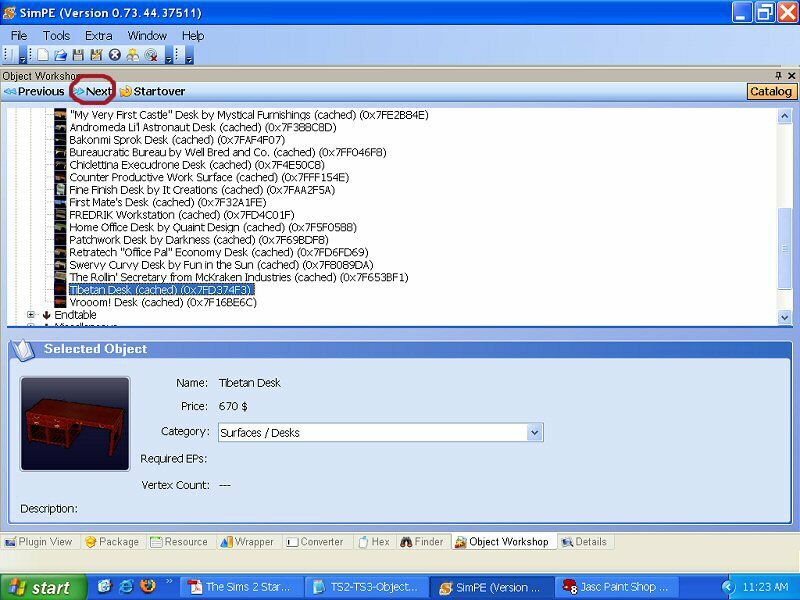 Click “Start” to load the Object browser, wait for the list of objects to load, pick the category and choose your object. Your chosen object is pictured with its description. I choose the deskcentralasian in the Surfaces category. Click the "next" button, and in the following menu, change recolour in the taskbar to clone with the dropdown menu and hit the Start button. Next, we see the "Scenegraph rename Wizard". Enter a unique name, (I named mine Coc-deskcentralasian-TS2forTS3) click “update”, then “OK”. 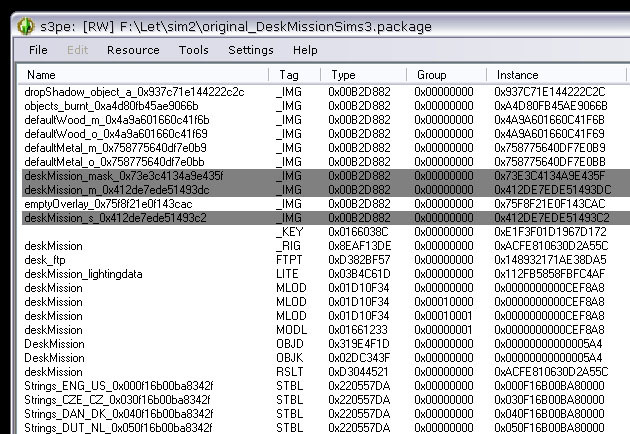 In the following save screen enter a name for the package, and save it in the Sims2 map in your projectfolder. I named my package Coc-deskTibetan-TS2forTS3. 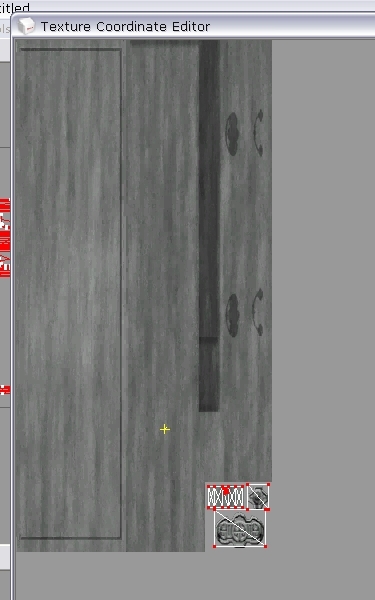 When cloning in SimPE since all your doing is getting the mesh and texture, uncheck all boxes prior to cloning. This will save you the step of renaming in the scenegraph, and it will pull the LIFO textures. Those are bigger sized and probably what you want over some of the smaller TXTR files. In SimPE click File-Open and navigate to the package you just saved in your project folder. In the upper left of the screen is a window named "Resource Tree" that lists all the bits that are in your package. If you don't see the Resource Tree window - activate it in the Window menu and while you're there, also make sure the "Resource List" and the "Plugin View" are activated. it. 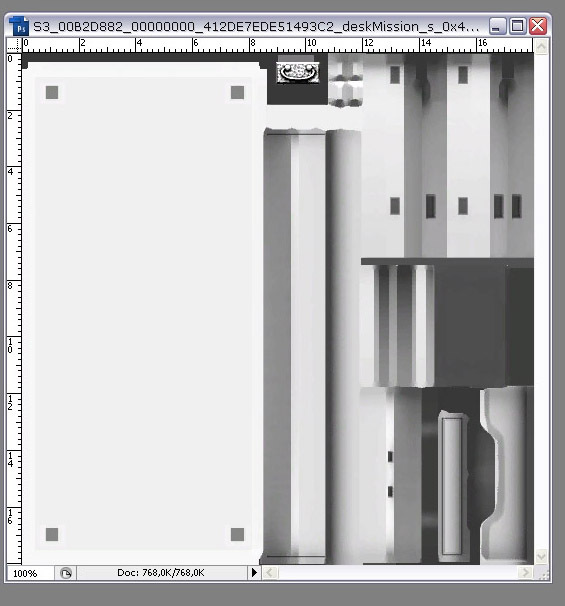 GMDC's are the mesh parts of the object we need. In the "Resource List" window (right of the Resource Tree window) you'll now see one or more lines that say (name of the object)_GMDC. If you click on a GMDC in the Resource list, information about that mesh is displayed in the "Plugin View" window. 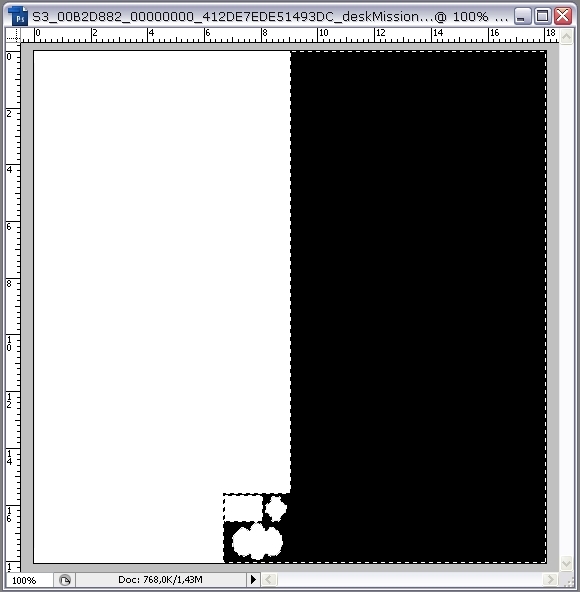 Now you will have to check which of the GMDC, contains the parts of the mesh you need. In my case I don't need the Coc-deskcentralasian-TS2forTS3_tslocator_gmdc, because that only contains wallshadow parts, and those shadows are created differently in TS3. The Coc-deskcentralasian-TS2forTS3_root_trans_gmdc contains all the parts of the mesh I need, including a groundshadow. In the Plugin View window I make sure all the meshparts are checked, and click the Export button. Edit: 13-10 After some experimenting and answers from Weshowe, I recommend to rightclick on the GMDC in the "Resource List" window and choose export. The file will have a .5gd extension, and you have to use the Unimesh plugin in Milkshape to Import the TS2 mesh. Importing the .obj sometimes can give extra duplicated vertices, check this by hiding all the groups, and if you have a screen with unconnected dots, just delete them. Click on it, and in the "Resource List" window now all textures in the package are listed. 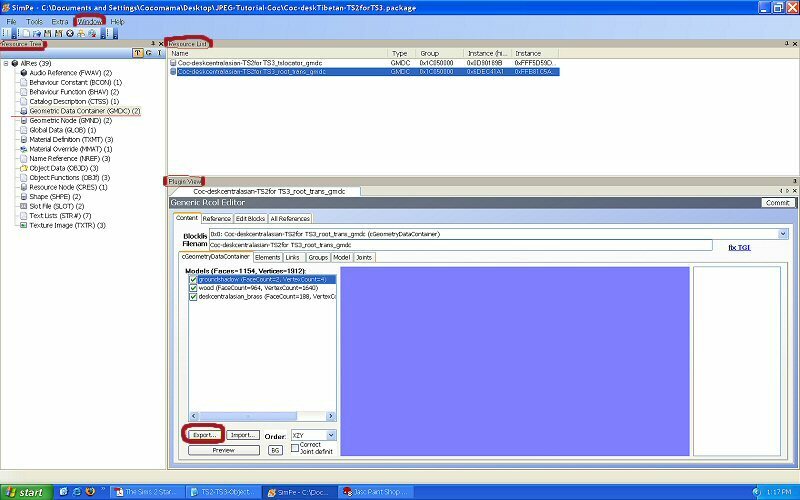 Click on a .txtr in the "Resource List" window, and information from that texture and a picture is now displayed in the "Plugin View" window. Right click on the picture and choose "Export" from the options menu, it will be saved as a .png file. 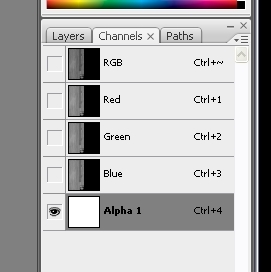 Right click again on the same picture and choose "Export Alpha Channel" from the options menu. Do this for all the textures on the list and save them all in your Sims2 map. Edit : If you don't have the DDS-utilities installed, export the textures with the "Export" button and choose the highest resolution. You can close your package and Simpe. After importing your TS3 cloned mesh into Milkshape as base object, import your extracted .obj mesh as/with Wavefront.obj. How to change the textures into useable DDS textures is quite another story and something I have yet to find out, so I hope somebody will make a tutorial for that. Much of the creation of objects for TS3 is still in the development stage, but I hope that with patience, determination, and a lot of work from our beloved tools and tutorial makers, one day we will be able to make whatever we want for our simmies. Last edited by Cocomama : 13th Oct 2009 at 2:08 PM. I guess that happens, if you don't have the DDS-utilities installed. And YES, YES please write a tutorial how to make DDS textures!! What about the CAST part? -You sometimes have to combine meshparts of your TS2 mesh (and on your texture-map) to have the same groups as the cloned TS3 mesh. Keep the groups in the same order and with the same name, as in the TS3clone. e.g. if the groundshadow came as group00 on top of the list and the main mesh as group 01, make sure it is the same when you export. -If a groundshadow meshpart is present in your TS2 mesh, you can use that, if the TS3 mesh had one too. You have to assign bones/joints to the groundshadow too. -Make your MLOD-00000000 mesh first, and second make your reduced polycount version MODL using DirectX... in Milkshape (Option in Tools). All object meshes I have seen sofar, all had at least these two. 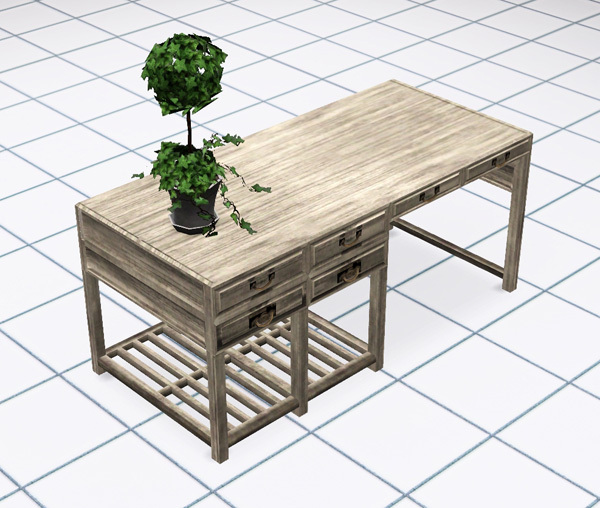 Some TS3 objects (indoor??) do not have shadowmeshes, and if so, you do not need to make them either. - If you have to make the shadowmeshes, use the MLOD-00000000 to make MLOD-00010000 and to make MLOD-00010001 you can use the MODL-00000001. Use the displacement and scale of the TS3 clone as guide. -All meshes in TS3 must have bone/joint-assignment to at least 1 point. Reducing polycount with DirectX in Milkshape makes the mesh loose its assignment, so you will have to remake it. -Your exported .png texture file from SimPE can be used as assigned material in Milkshape and can be/is also the size of your UV-map. Using the new version 1.0 of WesHowe Objecttool and Milkshape-plugins should avoid UVmap overflow messages. - When you finally have everything TS2 in place, renamed and in the same order of groups, use Model-select and select the whole TS3 meshpart dragging a box over it (not Group-select or Select All) and hit Del. Now I have to go and prepare dinner. 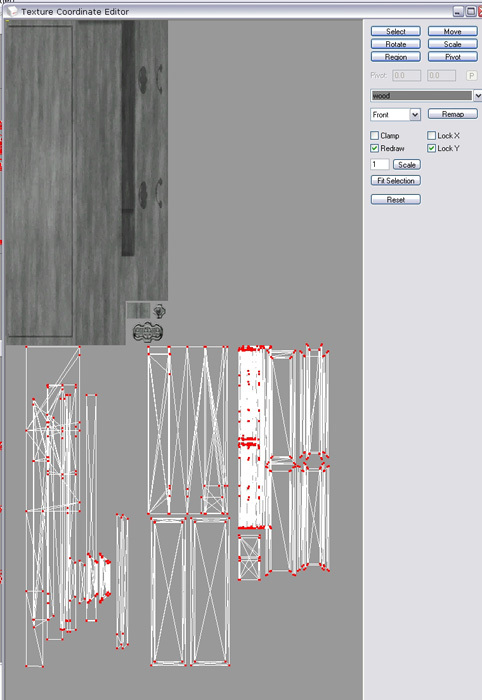 Okay here is the part where you try to make Sims 2 textures work for the Sims 3. I used Cocomama's tibet desk as my example too. NOTE: This process is just an example. Depending on what kind of object you choose to convert, the editing you need to do can be vastly different. Due to the nature of the subject I can't cover every possibility in a tutorial, you will need to use your creativity and common sense. I will assume you know how to use your graphics program, and also know how to do the rest of the process, as described in other tutorials. 1. Because the object to be converted is a desk, you clone a Sims3 desk for it to work properly. I chose the mission desk. Open your clone and find the _IMG resources. The ones you will need are these that bear the object's name. Export these to files (ctrl+shift+X) with their default names. 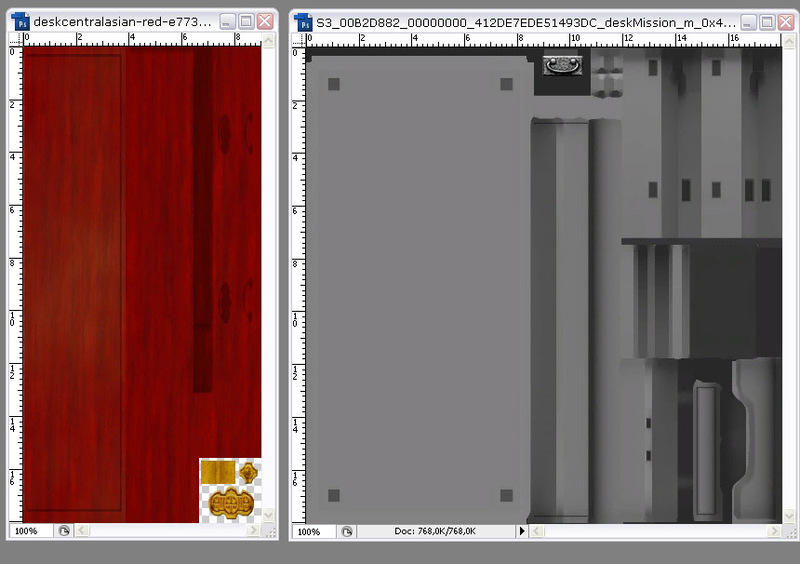 We can see that the Sims3 image is twice the size of the Sims2 image, that's okay. 3. 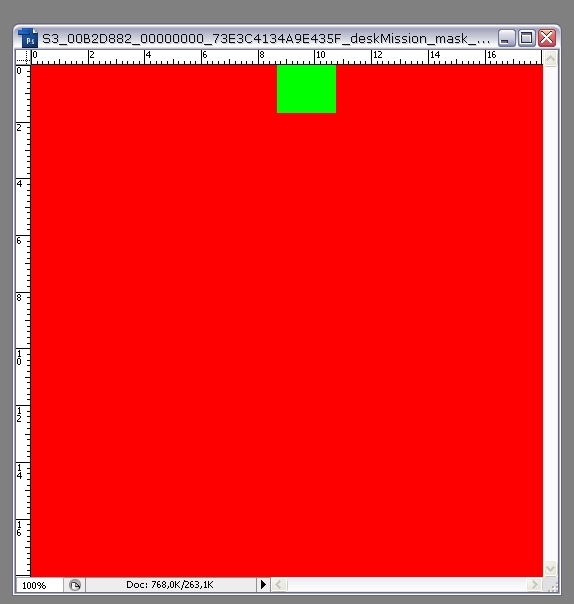 Copy the entire Sims2 image over to the bump map image. We want it to be similar to it. Now it is on a new layer. Desaturate it to grayscale. 4. Adjust the brightness/contrast or anything you need in order to achieve the general tone of the bump map. I should have got rid of the wood pattern too but I was too lazy. This means the new object will retain this wood pattern no matter what recolor you give to it in Create-a-style, if that's not what you want, erase the wood pattern now. If this seems too much work, just fill the whole image with 50% gray, that will make the object look very flat though. 5. Fill the background layer with black. 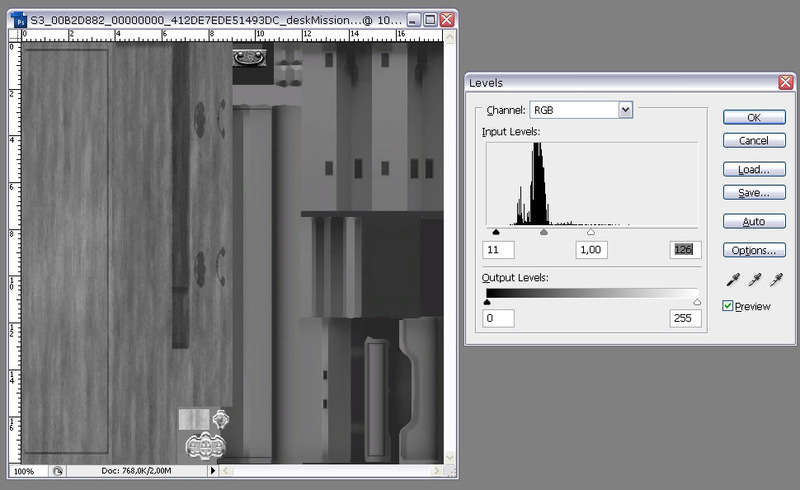 Then make a selection of the Sims2 image layer. 6. 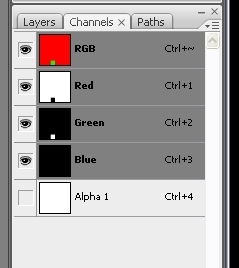 In the channels tab, click the alpha channel of the image, while the selection is still active. You can see the whole channel is white. 7. Invert the selection and fill with black. You need to do this especially if your object contains parts that have transparency, like these small handles at the bottom of our image. Now you can flatten the image and save to the same filename it had. 8. Now on to the specular map. This is the one that has "_s_" in its filename, S3_00B2D882_00000000_412DE7EDE51493C2_deskMission_s_0x412de7ede51493c2%%+_IMG.dds. This one appears to have no alpha channel in photoshop, it gets removed at opening because it is full black, so add one if it lacks. 9. Copy the Sims2 image to this one as well, brightening it to match, filling the background with black. Flatten, save. 10. Now the alphamask which looks like this. 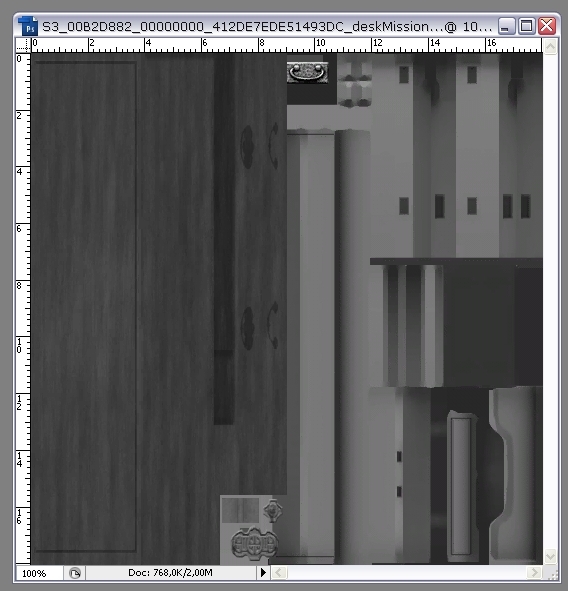 This image controls which parts of the object are recolorable, the red channel will be the first recolorable part (in the desk's case the body of the desk), the green channel will be the second recolorable part (the drawer handles in the mission desk). 11. Our Sims2 desk has handles too, and we can make them separately recolorable now, by adjusting this alphamask a bit. Look at the channels tab, there you can choose the channel you want to edit. 13. That's the easy part done, now on to mapping. 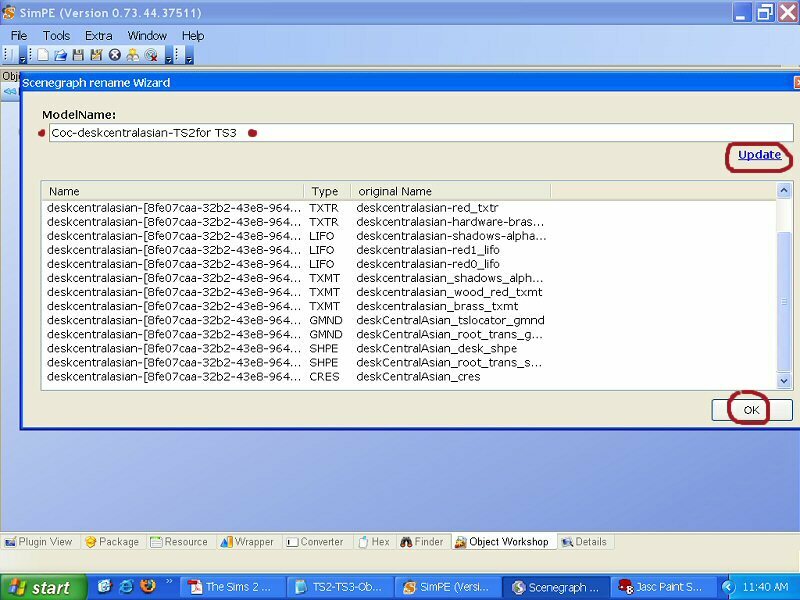 Open the Sims3 clone in Milkshape. (The 0x00000000 mlod decompiled.) Note the order of the groups, you will later need to export with the same group order. (Just memorize which one is the shadow.) Import the Sims2 .obj file over it. Use the Sims3 object as a guide to align your object properly, then delete it. 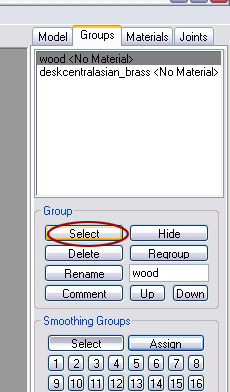 In the Groups tab, select all the groups that belong to your Sims2 object. 14. In the Materials tab, click "New" and then the [none] button above it, and browse to the bumpmap image file we saved earlier. After it is opened, click the "Assign" button while the groups are still selected. 15. Open the Texture Coordinate Editor from the Window menu. 16. You will see something like this, that's the selected group's UV coordinates over the texture. Your work now is to line up the dots with the texture. You most probably need to resize all, do this by using the Scale button in the top right corner and entering vales under it while the coordinates are still selected (red). Like 0.5 and 0.5 to resize it to half. Then move them to align with the image. Best not to try this piece by piece at first, because it just makes it harder. Of course if you filled your image with grey in step 4, it doesn't matter where the coordinates are, as long as the shapes they make keep their proportions. 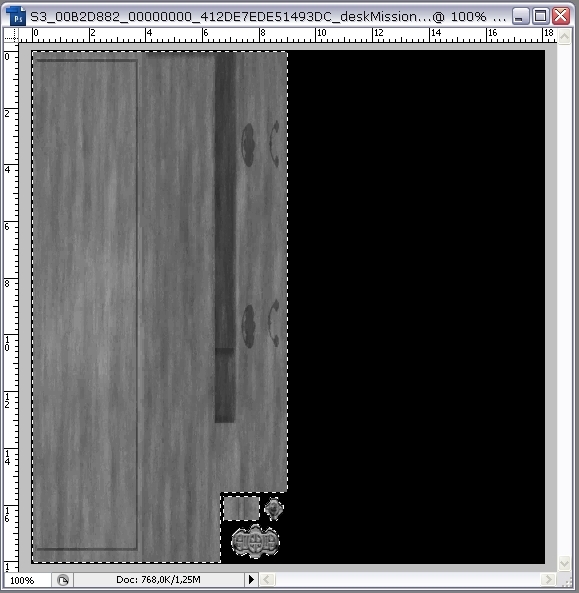 In both cases, make sure there are no stray dots that are out of the image boundaries (this is hard to see sometimes). 17. You can switch between groups with the dropdown menu to the right. This is the other group, the handles. I aligned them to cover the appropriate parts of the image. When you are happy with the UVmapping, regroup the groups of the Sims2 object, do bone-assignment, then export. 18. Recompile it, then import into the package with S3PE, and import every image you edited as well. Save, fix, and test in game. 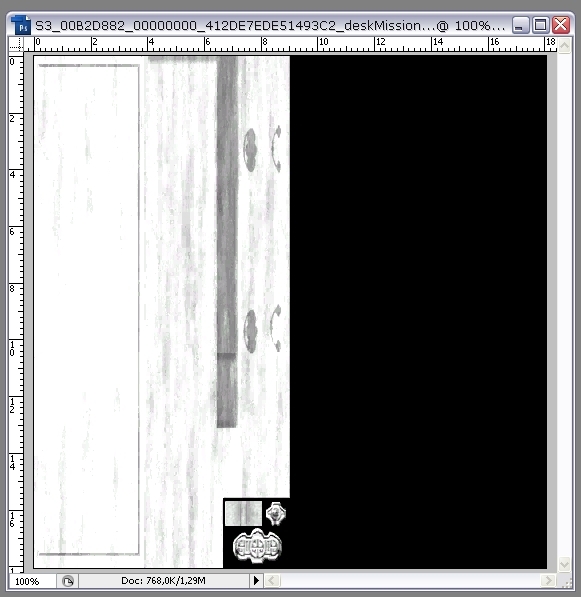 Here is the result with the just-out-of-the-catalog mission desk texture. You can see in the pic that I did a sloppy job with the mapping, that needs some after-adjusting, but the desk is functional and recolorable. If you are converting an object to a Sims3 clone that does have proper textures (ie. not all of it is CAStable), find the texture image resource in the package, it should have a similar name as the other images, but often with a "_o_" part in it (not always), and work on that first. You should copy the Sims2 texture over it without making it grayscale, then commit steps 5-6-7 on it. The rest of the process is the same. Last edited by lemoncandy : 2nd Oct 2009 at 11:56 AM. Haha thank you very much Cocomama for your time! Last edited by Hraklis943 : 28th Jul 2010 at 11:41 PM. I just saw the third part! Last edited by Hraklis943 : 1st Oct 2009 at 10:54 PM. Oh, thank-you so much. I'm going to try this when i've got some time! "Correctamundo! A word I've never used before, and hopefully never will again"
Thank you, you did a great job in explaining it all, I might even try it. At least I'm far more clearer with the steps now. This is VERY helpful. Both you and Cocomama, great job ! I would just like to add for the first post. When cloning in SimPE since all your doing is getting the mesh and texture, uncheck all boxes prior to cloning. This will save you the step of renaming in the scenegraph, and it will pull the LIFO textures. Those are bigger sized and probably what you want over some of the smaller TXTR files. Thanks HugeLunatic, I have added that information immidiately to Step 1. I have a question though, if you say bigger textures, are you talking about size in cm/inches or higher in resolution? I am used to get the LIFO's for body/clothing-textures. Bigger in resolution is great, that means better textures, but increased size in cm/inch would have consequenses to Lemoncandy's texturing part, I think? Last edited by Cocomama : 2nd Oct 2009 at 4:07 PM. LIFO textures are usually larger in size which (I think) means the resolution is also better, but I think objects generally tend to not go over 512x512. They can easily be sized down, and typically quality is better when sizing down vs. up. Most of the time SimPE object workshop pulls larger images, but I have found it does not always. I've got an alpha channel but everything is empty. I checked it's the desk specular i've not seemed to make a mistake. The only other choices of images I got are empty overlay, burnt, shadows, and default wood and metal. It must be something I have done but I really don't know... Someone has an idea of what am I doing wrong? Lemoncandy - Your welcome, most do have larger LIFO images. Question though, when I look at both the mask and specular I have no alpha channel for either. Did you skip a step or did you have an alpa when you opened in PS? I have PS CS3. Thats where I am now, but am going out now, so I cannot continue yet with this texture tutorial. 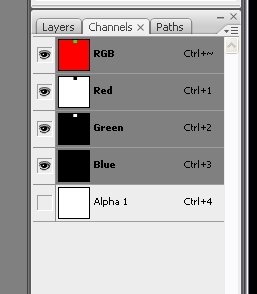 GIMP has a very large Help system, I collected a lot of data about layers and alpha channels from it. Just did not have time to read and learn it yet. Maybe I can hear from you how to go from here tomorrow. Please don't give up, we will get there, I am sure. Edit to say, I was answerring Lanawinst. Lana: try this: select your alpha channel only, and fill with black. what happens then? HugeLunatic: I use CS3 too, and I can see a white alpha channel when opening the mask image file, maybe it's a question of some kind of settings somewhere, I don't know. Thx, it's a lot of work to make a tuturial.. thx for making this one..it explains a lot .. i was having some problems with it .. If i fill the alpha channel with black everything turns black. I followed cocomama instructions and it worked! I'm actually trying to understand the uvmapping in milkshape... I used uvmapper. That's giving me a headache but i should be able to manage. Oh, lizy1952, sorry for the late reply. We even do not have a new tutorial yet, but I'm sure there will be translations. Well, I have to admit that I have not been able to make the specular texture with any of the graphics programs I tryed. I am used to PSP8, but that cannot open DDS files so at I tryed for 2 weeks with the GIMP, then an update to 12 for PSP and now finally with Photoshop CS3, I am still not able to produce a good specular texture. Well, I finally got it to not make my desk disseappear, but it is a bit how shall I say it ........see through. Not really transparent but if I turn my object textured with the specular in Milkshape, I can see parts of the mesh that are behind it. I know the specular texture needs a black alpha channel, except in the spots that are transparent? How do I add an alpha channel? Copy the selection to a channel will give me a new alpha1? Or do I have to click the add a channel button in the channel view? I need the TS2-TS3 conversion tutorial I am making to be newbie proof, so I need to record the exact steps, to have them get the same result I explain in the tutorial. Could you please expand your tutorial a bit to include some directions about how to (commands, buttons ed) get the same result you got?